We didn’t post a reminder, but we did mention it in the post for flag-flying in April: Did you fly your flag for Easter? Did you notice whether anyone else on your block did? Is April the cruelest month? It’s cruel to people who want to fly U.S. flags often, but only on designated flag-flying dates. (April is also National Poetry Month, so it’s a good time to look up poetry references we should have committed to heart). For 2019, these are the three dates for flying the U.S. flag; Easter is a national date, the other two are dates suggested for residents of the states involved. One date, nationally, to fly the flag. That beats March, which has none (in a year with Easter in April and not March). But March has five statehood days, to April’s two. Take heart! You may fly your U.S. flag any day you choose, or everyday as many people do in Texas (though, too many do not retire their flags every evening . . .). Three dates to fly Old Glory in April, by the Flag Code and other laws on memorials and commemorations. April usually sees the opening of Major League Baseball’s season — some teams jumped into March in 2018. In this photo, U.S. Navy sailors assigned to the USS Bonhomme Richard practice for the San Diego Padres’ opening day flag ceremony in San Diego on April 5, 2011. 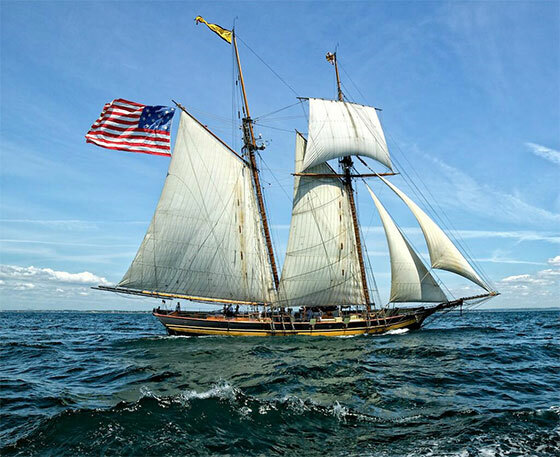 The ship sent nearly 300 volunteers to unfurl an 800-pound U.S. flag that covered the entire field. The Bonhomme Richard was in dry-dock for maintenance and upgrades. Defense Department photo via Wikimedia. April is the month to fly your flags! April 2018: When do we fly our flags? U.S. flag flutters from the back of a boat on the Atlantic Ocean, in Maine. Photo from Peter Jon Lindberg. Maine joined the union on March 15, 1820, the 23rd state. It was created out of what had been lands of the colony of Massachusetts. Maine gave us a Vice President, Hannibal Hamlin, under Abraham Lincoln. In Hamlin’s term he disappeared from Washington, D.C. At some length, a story goes, Hamlin was tracked back to Maine where he had enlisted in the Civil War effort, cooking for the troops. Blaine was no slouch. He served 13 years in the U.S. House of Representatives, rising to the position of Speaker, served a term in the U.S. Senate and was twice U.S. Secretary of State, under three different presidents. Lobster trap floats and Old, in Bar Harbor, Maine. Photo copyright by Greg A. Hartford, AcadiaMagic.com. Maine has a lot of people flying U.S. colors, judging from photographs. Good on them all. I wonder whether Mainers celebrate statehood, or just let it pass? Maine manufactures U.S. flags. 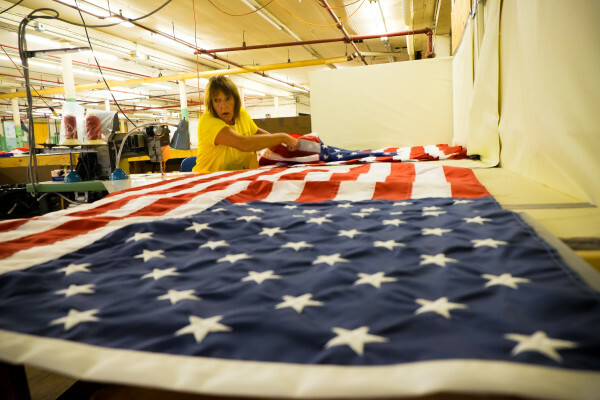 Bangor Daily News: “Sherry Jewel, a production supervisor for Maine Stitching Specialties, stitches together an American flag at the former Dirigo Stitching factory that was restarted two years ago.” 2016 story, photo by Bill Swain. I usually put up a post near the first of the month listing the occasions upon which U.S. laws urge us to fly Old Glory. March sometimes slips by without such a post. No good reason, other than in most years, March offers no regular national commemorations upon which flag flying is urged. The odd year is when Easter comes early. Easter is one of the holidays the Flag Code says flags should be flown. But, most years, Easter falls in April, as it does in 2018. The Flag Code urges residents of states to fly the U.S. flag on the anniversary of their state’s entering the union, on statehood day. Those are the only dates in March, most years. In March, we have four statehood days in the first four days of the month. If I dawdle, we miss most of the dates. Okay, all but one already past in March. Apologies to Ohio, Nebraska and Florida. Surely you can find the stories of their big parades and flyovers for statehood in Google News. St. Patrick’s Day revelers and parade marchers display the U.S. flag, but it’s not an official U.S. observance. I keep hoping, but I get little traction for a law urging flying the flag to observe Freedom Day, on the birth anniversary of the Father of the Constitution, James Madison (he was born March 16, 1751). People gathered on the lawn of James Madison’s home in Montpelier, Virginia, to display the U.S. flag in a card display, 2011. AP photo? Much irony, and great history, in the U.S. colors being shown so dramatically on St. Patrick’s Day, a day relatively uncommemorated in Ireland, and commemorated in the U.S. chiefly to help overcome bias against Irish immigrants. Some irony in the unmarked birthday of the Father of the Constitution. 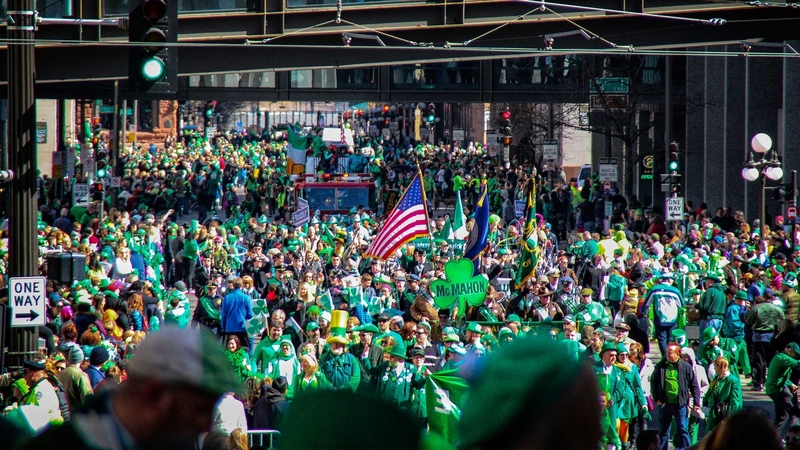 U.S. colors stood out in a field of green at the St. Paul, Minnesota, St. Patrick’s Day parade, 2015(?). Photo from VisitStPaul.com. Yes, this is a bit of an encore post. Defeating ignorance takes patience and perseverance. You want to mark your calendar so you remember to put your U.S. flag up on those dates designated by law and tradition, right? Which dates in February? Here at the Bathtub, we’re running behind on the news — we’ve missed marking Massachusetts statehood. You may fly your flag on state holidays, too — which of those dates do we see in February? Is there a good list? Though we don’t mark it usually, February 14 is the anniversary of the first recognition of the Stars and Stripes by a foreign government, in 1778. The French fleet recognized the ensign carried by Capt. 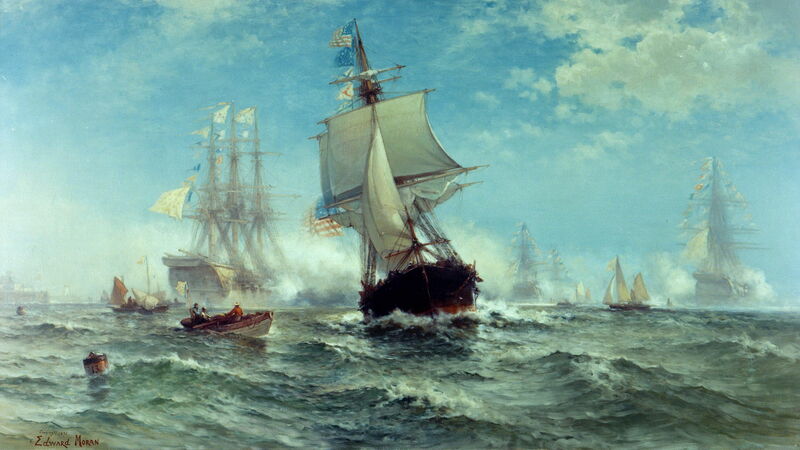 John Paul Jones, at Quiberon Bay — painting of the event is at the top of this post. February 23 is the anniversary of the raising of the U.S. flag on Iwo Jima, in 1945 — 74 years ago. We should probably watch for proclamations to fly the flag on that date, an anniversary made more important simply because so few survivors from among the veterans of that war and that fight can be expected to live to see the 80th anniversary. Regardless any official, formal proclamation to fly the flag for the Iwo Jima events, you may always fly your flag. Please visit earlier posts at Millard Fillmore’s Bathtub, on the death of Joe Rosenthal, the photographer who took the widely-released iconic photo; on the death of Charles Lindberg, pictured in the first flag-raising on Mt. Suribachi; on the death of Raymond Jacobs, the last-surviving veteran from the flag raisings; and on my visit to the Sunset Parade at the Iwo Jima-themed U.S. Marine Memorial overlooking Washington, D.C.
President Grover Cleveland signed the proclamation making Utah the 45th state on January 4, 1896. Utah residents should fly the U.S. flag today in commemoration. Flying the U.S. flag is a big deal in Utah. Most families have at least one flag to fly on holidays. But in my decades in the state, I don’t think I saw anyone fly the flag for Utah Statehood day. Utah’s public officials take their oaths of office on January 4, traditionally. In the past couple of decades, a ball for statehood, a Statehood Dance, is scheduled on a Saturday close to January 4, in the museum in Fillmore, Utah, which once was the territorial capitol building before the capital was moved to Salt Lake City. Got a U.S. flag, Utahns? Fly ’em if you got ’em. 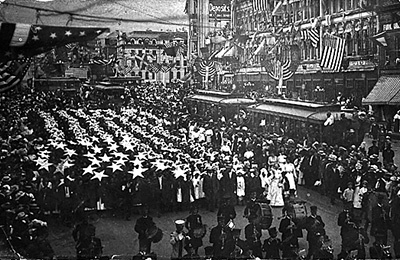 Marchers carrying stars and colored material to make stripes for a flag in a statehood parade in Salt Lake City, 1910. Photo from the University of Utah Marriott Library. Rare 1900 campaign flag featuring portraits of President William McKinley and Vice President nominee Theodore Roosevelt. Such a display is contrary to the U.S. Flag Code today, but in 1900 there was no flag code, and not really much solid regulation on U.S. flags. Bonsell/Americana image. You are currently browsing the archives for the Flag etiquette category.